Earlier this year marked the 50th anniversary of the decisive Wave Hill Walk Off, in which 200 Gurindji men and women – stockmen and servants – protested against unfair work and living conditions. In the new book Yijarni: True Stories from Gurindji Country, editors Erika Charola and Felicity Meakins bring together compelling oral accounts of not only the Wave Hill Walk Off but also the history of the Gurindji people before and well after. It’s the first book to provide a history of the local district in the original language. Here, Sarah Trevor talks to Erika and Felicity about the research and challenges behind editing this book. IHM: What originally drew you to the stories of the Gurindji Country? Erika: We came across them doing other work we were doing at Kalkaringi/Daguragu (both as community linguists, Felicity as a language researcher and Erika as an educator). 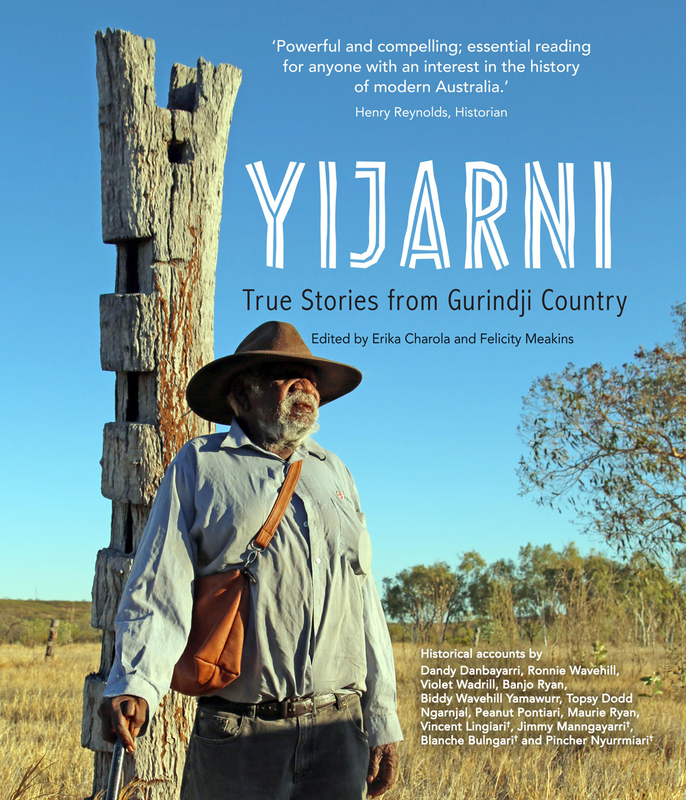 IHM: Yijarni: True Stories from Gurindji Country is based upon oral accounts from the Gurindji people. Could you please tell us a bit about the process of putting together these oral accounts? Erika: Some had previously been recorded by other linguists: Patrick McConvell lived at Daguragu and prepared the anthropology report for the Land Claim in the 1970s and Helen and Norm McNair worked for Summer Institute of Linguistics in a Baptist Mission. Erika recorded several at the instigation of elders Ronnie Wavehill and Dandy Danbayarri, with whom she was working with on a Gurindji language program at Kalkaringi School. However the stories were generally not suitable for the school program – too long and too difficult. But we knew they were special and should be published. Felicity recorded others in the course of a language documentation project and others specifically for the book. We had the opportunity to transcribe, translate and conduct archival research on some of the stories for the DOBES (Documentation of Endangered Languages) project (through the Max Planck Institute). Later Felicity and Penny Smith, photographer and co-ordinator of Karungkarni Art and Culture Aboriginal Corporation, planned a collaboration that included the Gurindji artists, the Central Land Council’s Murnkurrmurnkurr Rangers and later, Brenda L Croft, photographer and curator with Gurindji, Mudburra and Malngin heritage. Within the Kalkaringi/Daguragu community there is a group of people who have been involved in Gurindji language projects for decades. They were involved in listening to the recordings of the stories and/or reading the draft copy that we prepared. IHM: The stories in Yijarni are told in both English and Gurindji. How have you found the experience of learning Indigenous languages? Erika: Gurindji is the only Indigenous language I’ve attempted to learn to a significant extent. I was apprehensive at the start because learning languages works best through having a personal connection to the language and seeing yourself as a language speaker, which wasn’t the case when I started. But I quickly developed a strong motivation and with strong positive support from elders I made enough progress to understand basic exchanges and stories. The rewards of the work – getting an understanding of stories and cultural information, as well as seeing the positive responses from children and elders to Gurindji materials – was a great motivator. Felicity: I’m not a great language learner myself but I find the ways that languages are the same and differ fascinating. So in a sense my approach to learning Gurindji is not the normal way you would learn a language. I record stories, write them down and discuss them with the narrators – and then generally get caught up in some interesting grammatical quirk or other! But the rewards of getting to know Gurindji have been great. It has given me a small window into another way of looking at the world and other people, and some more understanding of different ways of relating to land. IHM: Were there any instances in particular where you were taken aback, or strongly moved, by something you discovered while putting this book together? IHM: What were some of the challenges involved in researching the book? Erika: Luckily we both had opportunities to check stories thoroughly with speakers and community members. In terms of archive research, the Wave Hill Station records (except for one improvements book) were burnt by the manager before the sale of the station in the 1990s (see the book A handful of sand: the Gurindji struggle, after the walk-off by Charlie Ward, Monash University Publishing, 2016), so a possible source of corroborating information was erased from history. Apart from that the main challenge was time. We both worked on the book in our spare time around full-time jobs, so we are fully aware that this aspect of the research has scope for more comprehensive work. IHM: Which resources did you find most helpful in the course of your research? Erika: Françoise Barr of the Northern Territory Archive Service in Darwin. Françoise directed us to police and government records. We are not historians; this assistance was invaluable. IHM: What would be your advice for anyone looking to learn more about twentieth-century Indigenous history? Erika: The answer to this question depends on the context the person finds themselves in. They could contact an Aboriginal community organisation such as a language centre, museum or culture centre. Watch NITV or shows like Living Black on SBS. There’s some wonderful documentaries around such as Contact which aired on the ABC and is narrated by a Martu woman, Yuwali, in her language. She talks about the moment when she encountered white people in the Great Sandy Desert for the first time. An absolutely mesmerising one hour. Another fascinating series is First Australians which was an SBS series directed by Rachel Perkins. In particular the first episode about the Sydney colony digs into the early first relationships between white people and the local Aboriginal people which were very complex. Look in state libraries for publications, as many histories go out of print quickly so bookshops will usually only have a small selection of what has been printed. (Ask at the help desk.) A surprising number of histories told by Indigenous people have been published over the years. Aboriginal Studies Press has published many of these books, as has IAD Press and Megabala Books. There’s also a journal published by ANU called Aboriginal History, with many contributions by Aboriginal historians. It’s free to download. There’s plenty of information around – just whether you want to find it is the part that makes the biggest difference.